London Gay Art Festival GFEST – Gaywise FESTival Returns Today – in Tottenham! GFEST – Gaywise FESTival® is recognised as ‘London’s Lesbian, Gay, Bisexual, Transgender, Queer and Intersex (LGBTQI) cross – art festival for all’. The Festival is organised by North London based arts charity Wise Thoughts led by artistic director Niranjan Kamatkar. Over the last six years, GFEST has been supported by the Prime Minister, Cultural Secretaries, Ministers for Arts, Mayors of London, MPs, Celebrities, intellectuals, academics and artists and is now poised to return back today after a year’s gap. The festival will open today with visual arts exhibition. GFEST 2013 will screen critically acclaimed films, including the feature film ‘The new Black’ on Friday the 8 November. Hip-hop & rap music performances are billed as ‘Noisy bytes’ on Saturday the 9 November and exciting arts and film workshops will take place on the 8th and the 9th November. GFEST 2013 ‘Bollywood Blast Party’ will be the final event this year on Saturday the 9th November. All GFEST 2013 events will take place at Bernie Grant Arts Centre in Tottteham, London N15 4RX. 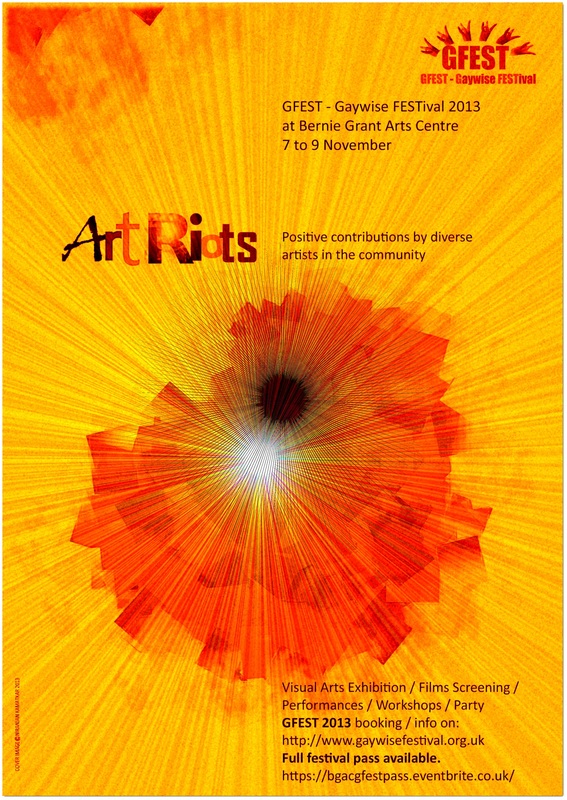 The late MP Bernie Grant, in whose memory the arts centre is build, was a great champion of LGBT rights. Art Riots in Tottenham from 7 to 9 November – GFEST 2013 broader theme is ‘Art Riots’ – positive contributions by diverse artists in the community. The organisers of the festival have called on the London Gay and LGBTQI community to show their ‘art pride’ by attending as many events to celebrate the festival’s return.